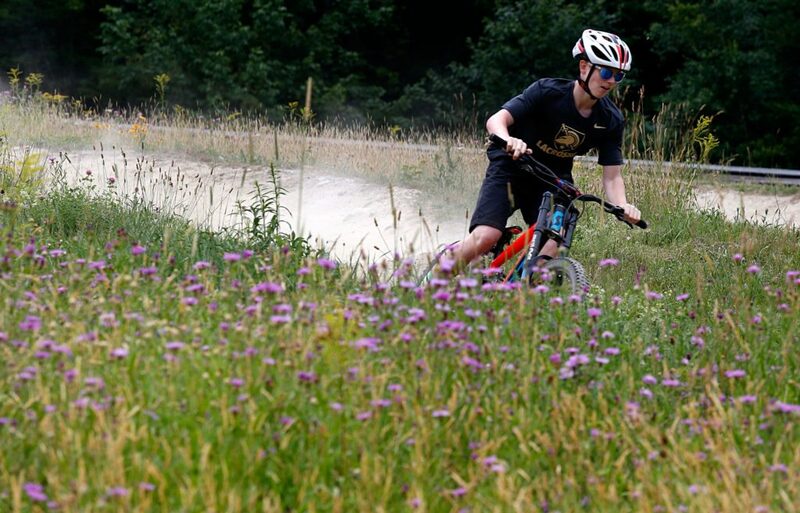 Colby Bettens, 14, of Concord, N.H., takes a turn towards the end of the Dirt Serpent trail on bikes he and his father rented for their first time riding at the Mount Sunapee Resort in Sunapee, N.H., on July 14, 2018. After taking a chairlift ride to the top, the mountain bike trails are all downhill -- they opened at the resort seven years ago. (Valley News - Geoff Hansen) Copyright Valley News. May not be reprinted or used online without permission. Send requests to permission@vnews.com. 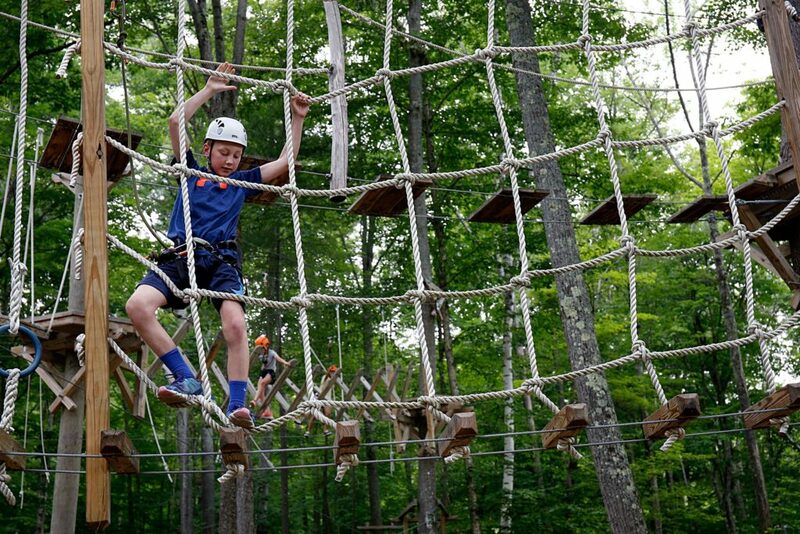 Ryan Flaherty, 12, of Foxborough, Mass., maneuvers through the Aerial Challenge Course at Mount Sunapee Resort's Adventure Park in Sunapee, N.H., on July 14, 2018. The resort has added several recreational activities for summertime enjoyment. (Valley News - Geoff Hansen) Copyright Valley News. May not be reprinted or used online without permission. Send requests to permission@vnews.com. 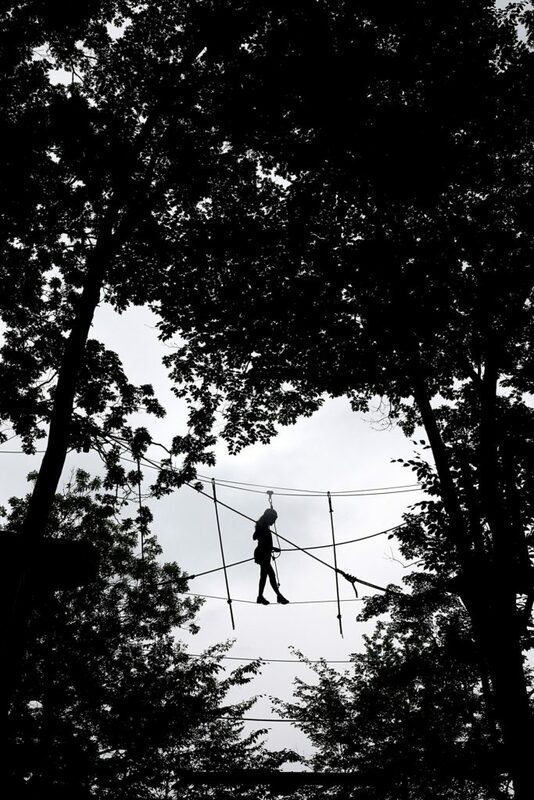 While buckled in with a harness, Molly Flaherty, 15, of Foxborough, Mass., watches her step as she negotiates a tightrope at the Aerial Challenge Course at Mount Sunapee Resort's Adventure Park in Sunapee, N.H., on July 14, 2018. The resort has added several recreational activities, including the course, to become a year-round destination. (Valley News - Geoff Hansen) Copyright Valley News. May not be reprinted or used online without permission. Send requests to permission@vnews.com. Betty Holcomb, of Newbury, N.H., watches her granddaughter Betty Holcomb, 10, of Durango, Colo., make a putt on the mini golf course at Mount Sunapee Resort's Adventure Park in Sunapee, N.H., on July 14, 2018. Betty Holcomb usually comes to visit her namesake once a year. (Valley News - Geoff Hansen) Copyright Valley News. May not be reprinted or used online without permission. Send requests to permission@vnews.com. 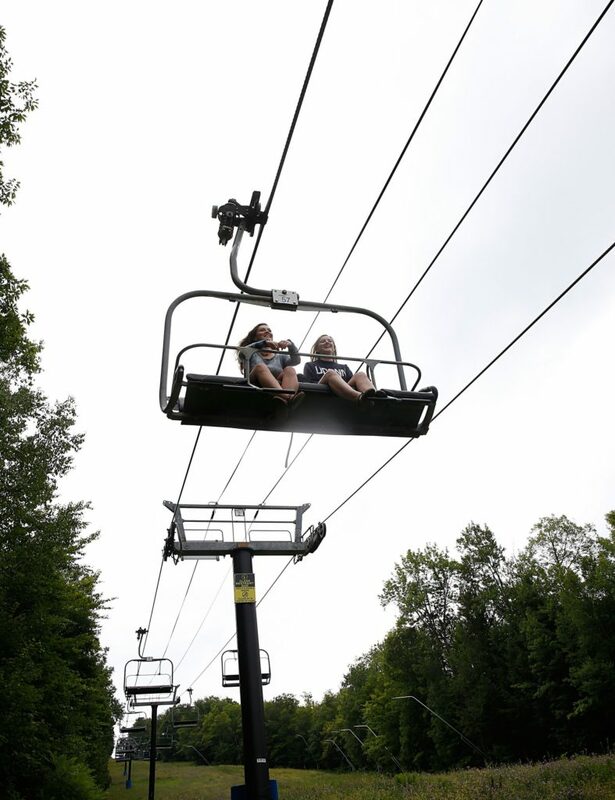 After spending time at the summit with their friends, Ali Sailer, of Warner, N.H., left, and Taylor Ludl, of Ridgefield, Conn., ride the chairlift down the mountain at the Mount Sunapee Resort in Sunapee, N.H., on July 14, 2018. Sailer said she spends a lot of time at the resort year round. "This is home," she said. (Valley News - Geoff Hansen) Copyright Valley News. May not be reprinted or used online without permission. Send requests to permission@vnews.com. 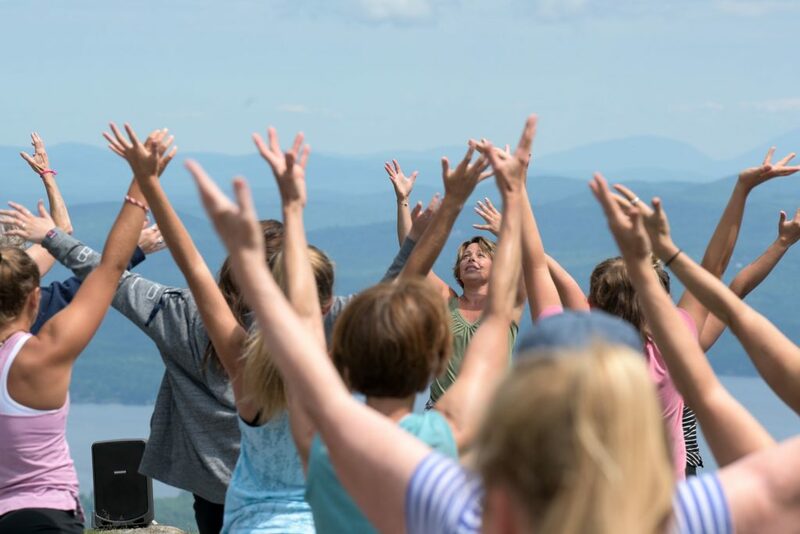 Yoga instructor Leigh Ann Root leads sun salutations durig her yoga class at the top of Mount Sunapee in Newbury, N.H., Wednesday, July 11, 2018. (Valley News - James M. Patterson) Copyright Valley News. May not be reprinted or used online without permission. Send requests to permission@vnews.com. 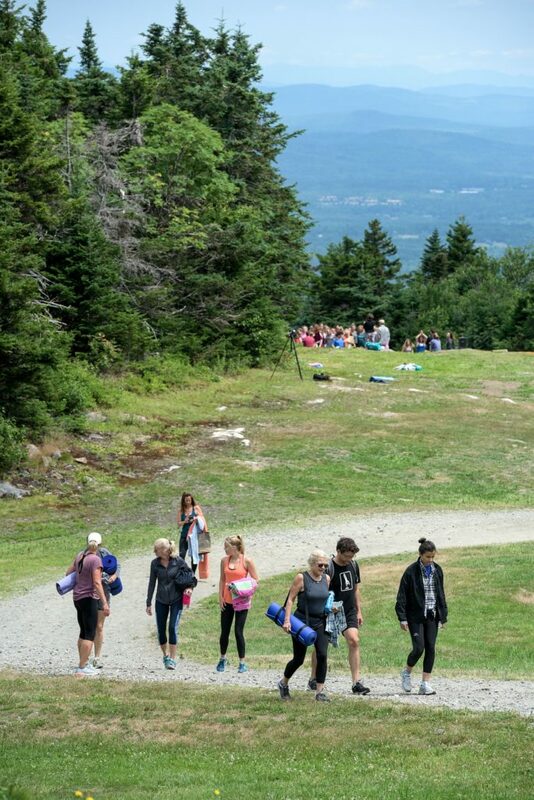 Yoga participants walk back to the ski lift for a ride down Mount Sunapee after their class Wednesday, July 11, 2018. (Valley News - James M. Patterson) Copyright Valley News. May not be reprinted or used online without permission. Send requests to permission@vnews.com. Linda Sacco, left, and Arthur Sacco, of Newbury, hold their downward dog position during yoga at the top of Mount Sunapee in Newbury, N.H., Wednesday, July 11, 2018. (Valley News - James M. Patterson) Copyright Valley News. May not be reprinted or used online without permission. Send requests to permission@vnews.com. 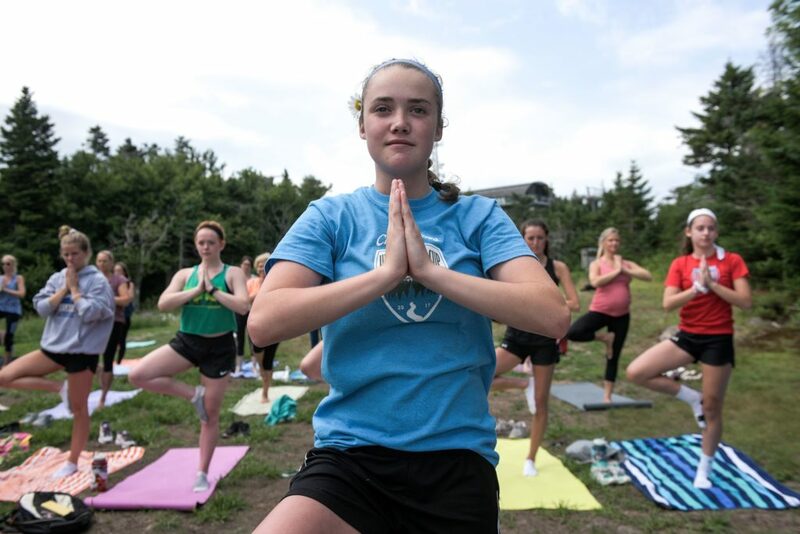 Rayna Tucker, 14, of Springfield, N.H., hiked up Mount Sunapee in Newbury, N.H., with the Kearsarge girls soccer team to participate in a yoga class Wednesday, July 11, 2018. (Valley News - James M. Patterson) Copyright Valley News. May not be reprinted or used online without permission. Send requests to permission@vnews.com. Summer on Mount Sunapee is in full swing as the town of Sunapee prepares to celebrate its 250th anniversary in August. On the slopes, visitors can enjoy an expanding array of warm weather activities like three-dimensional archery, mountaintop yoga and guided hiking. The Adventure Park features rope courses and rock climbing, and the newly opened Evolution Bike Park offers 5 miles of lift-served mountain biking trails with names like the Dirt Serpent, Out-N-Back, Sidewinder, Flo-Motion and Rock This Way. With three quaint lighthouses and picture-perfect villages, Lake Sunapee and its nearby towns provide the ideal surroundings for the resort to segue seamlessly from alpine skiing to downhill mountain biking. Winters are getting shorter and warmer, baby boomers are aging out of their prime skiing years, and young families have less time and money to spend on resort vacations. Add to that a 2011 law that opened ski areas on U.S. Forest Service lands to summer activities, and snow isn’t the only reason to go up and down a mountain anymore. The growing portfolio of summer activities on mountains in Vermont, New Hampshire and around the world reflects these fundamental and far-reaching shifts in the ski resort industry. Between Mother Nature, demographics and international demand, resorts are adapting to new realities, refining their strategies to capture summer business and looking for ways to entice visitors to the mountains for more than skiing or snowboarding. 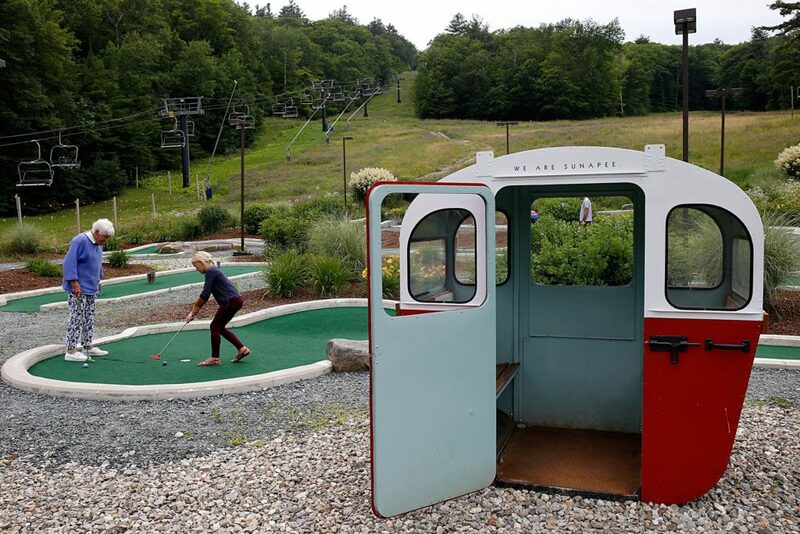 In parts of New Hampshire and Vermont, where skiing traditionally has been the big draw, resort owners are banking on summer to attract more visitors, retain employees year-round and appeal to young families, day-trippers and summer’s bumper crop of tourists. It’s a long-term approach that focuses on reinvesting in ski equipment, keeping winter activities steady, re-tooling resorts for summer uses — quad lifts with bike racks, for example — and promoting New England’s legendary summer beauty. According to data compiled by the NSAA in 2014, some 84 percent of U.S. ski areas operate during the summer, and warm weather visits increased by 37 percent during the five years leading up to the study. “We’re seeing an uptick in summer and fall revenue at ski resorts across the United States,” says Elizabeth Burakowski, a research assistant professor at the University of New Hampshire’s Institute for the Study of Earth, Oceans, and Space. Burakowski’s most recent report, “Economic Contributions of Winter Sports in a Changing Climate,” focuses on the impact of global warming on ski areas and on activities that rely on cold weather. “Depending on how you look at it, a shorter winter is a downside for skiers and snowboarders, but a huge upside for mountain bikers, hikers, rock climbers and other outdoor enthusiasts,” she says. Summer also lets resorts take advantage of the long vacation season when kids are out of school, parents may have more time, there are more places to go and overall it’s easier to get there. A happy byproduct of year-round activity is that employment and economic activity in surrounding towns can become more stable. For an industry that traditionally has relied on the unreliable — weather — taking advantage of every season means more profit, more jobs, more revenue for towns and states, and better utilization of every mountain’s unique environment. Adding summer activities has been a successful strategy for the Woodstock Inn & Resort, explains President and General Manager Greg Thulander. 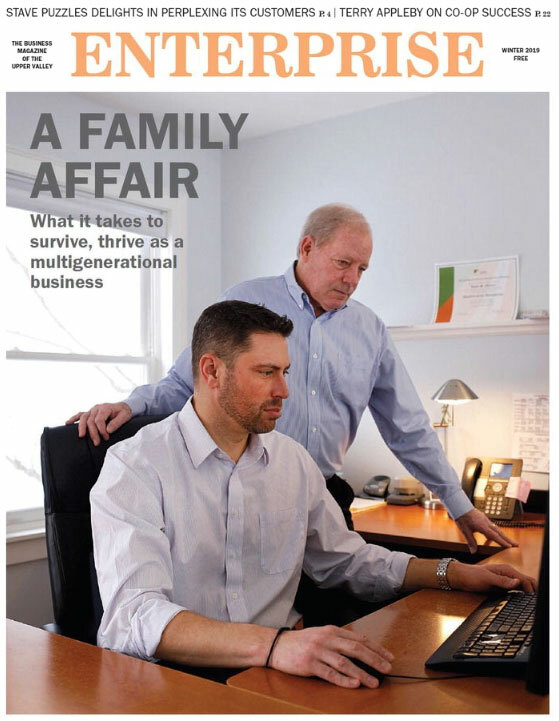 Straddling the towns of West Windsor, Weathersfield and Brownsville, Mount Ascutney has seen its fortunes rise and fall. It boasts one of the first Vermont state parks, and its granite campsites and rangers’ quarters were built by the Depression-era Civilian Conservation Corps. More recently, a succession of private resort owners have struggled, and the base lodge was idled in 2010. Since then, public and private groups have teamed up to form Ascutney Outdoors, a nonprofit that oversees the mountain’s recreational and environmental assets. Ascutney offers 30 miles of summer hiking trails and is the site of the Vermont 50, an event that draws mountain bikers and ultra-runners from around the country. Proceeds from the race go to Vermont Adaptive Ski and Sports, a nonprofit that offers programs designed to engage people in outdoor sports regardless of ability. “Our key is being multi-season and multi-use,” Crihfield says. Though ski areas increasingly are focusing efforts on bolstering their summer recreation offerings, the truth is summer always has been a big draw for the area. Tourism throughout the year is a major economic driver in Vermont and New Hampshire. Victoria Cimino, director of the New Hampshire Division of Travel and Tourism, outlined the scope of its impact at the governor’s annual conference on tourism in May. The Granite State’s 2.23 million visitors last year spent $5.5 billion, resulting in $269 million in revenue and supporting 48,000 jobs. In Vermont, economist Kenneth Jones conducts analyses on the impact of tourism and publishes a biennial Benchmark Report for the state’s Department of Tourism and Marketing within the Agency of Commerce and Community Development. Data from the 2015 Benchmark Report show that 5 percent, or more than $950 million, in salaries and other income was generated by tourism between 2013 and 2015. Year-round tourist spending accounts for approximately 8 percent of Vermont’s gross domestic product. The most recent statistics from New Hampshire show a similar trend. According to a 2012 report by Laurence E. Goss at Plymouth State University’s Institute for New Hampshire Studies, direct spending by tourists and travelers in 2011 totaled $4.3 billion, or roughly 7 percent of the state’s estimated GDP for the same period. Travel spending in New Hampshire for summer 2017 alone totaled $1.78 billion, up 4 percent from the previous year’s. Ski New Hampshire, a not-for-profit, private trade association that represents 34 alpine and cross country resorts, partners with Plymouth State University to measure ski areas’ impact on the state’s economy. According to its 2012 report, “The New Hampshire Ski Industry 2012-2013: Its Contribution to the State’s Economy,” 1,107 employees were directly supported by summer and fall visitor spending, and an additional 905 jobs benefited from secondary sales, accounting for some 3,604 jobs in the Granite State that could, at the time, be attributed to summer and fall activities at ski areas. In one of those “aha!” marketing moments, someone conceived of a clever way to promote New Hampshire as a summer destination: Erect a giant billboard at the entrance to the Holland Tunnel in New York City depicting whitewater kayakers in New Hampshire. The irony of the tagline, “There’s more than one way to cross a river,” isn’t lost on commuters criss-crossing the Hudson between New Jersey and New York. The billboard is part of a multifaceted publicity campaign that promotes the “Live Free” marketing push recently launched by the Granite State, where tourism officials are anticipating a record-breaking summer for 2018. They predict that some 3.4 million visitors will visit New Hampshire and spend at least $1.8 billion at resorts, parks, lakes, golf courses and other attractions. Tourism and economic development agencies in both states are devoting more resources to promoting summer offerings. “We launched our first summer campaign last year,” says Karolyn Castaldo, communications and marketing manager for Ski New Hampshire. The 16-second social media spots highlight mountain biking, ziplining and hiking, and new videos will be unveiled in time for the 2018-19 summer season. With slogans like “get dirty,” “embrace the mountain” and “gear up,” the spots showcase New Hampshire’s mountains as the ideal destinations for younger guests who are more interested in family-oriented recreation. Several years ago, the Vermont Department of Tourism and Marketing teamed up with the Vermont Ski Areas Association to conduct a research report, “Leveraging the Vermont Brand,” that zeroed in on “the Vermont brand” and identified attributes that differentiate winter and summer tourists. Attracting winter visitors means emphasizing that Vermont is a “good value,” filled with “warm, friendly people” situated in an “unspoiled landscape” that “isn’t crowded.” Summer tourists, on the other hand, respond favorably to messages that describe the state as “original and real,” where travelers can enjoy “creative culinary choices” in a “traditional and independent” setting, according to the report. Laurel Stavis, a resident of Lebanon, is a contributor to Enterprise. Amanda Newman is a Valley News night desk editor and the design editor of Enterprise. She can be reached at anewman@vnews.com or 603-727-3215.